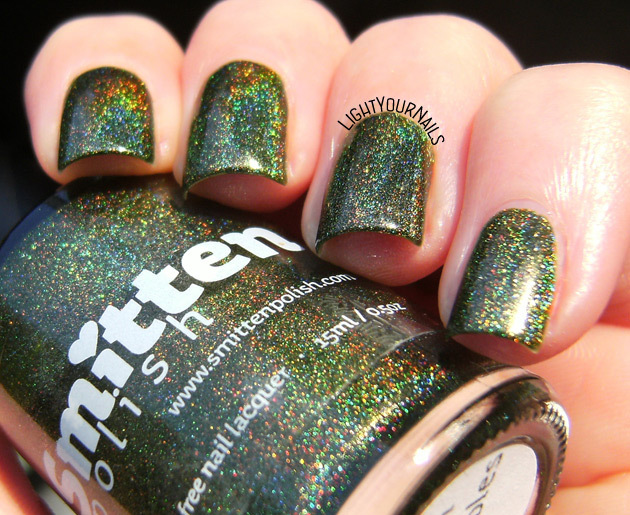 Smitten Polish Between the Baubles | Light Your Nails! Quick swatch today! You’ve already seen Smitten Polish Between the Baubles as base for my Christmas trees mani but it definitely needs a post on its own. Swatch veloce oggi. Avete già visto lo smalto Smitten Polish Between the Baubles come base della mia nail art a tema alberi di Natale ma si merita un post tutto suo. 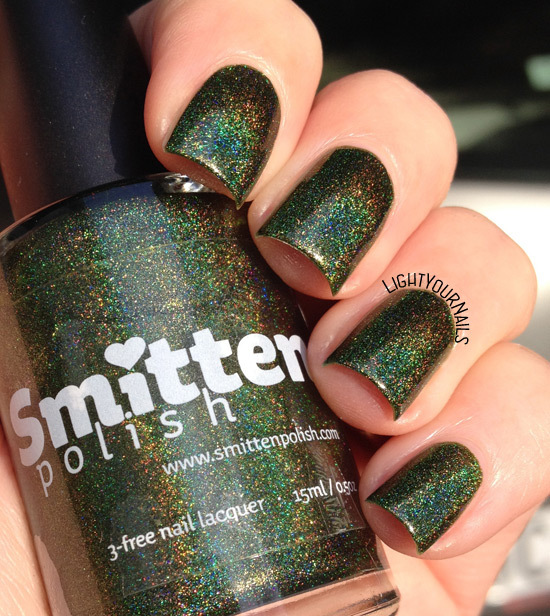 Smitten Polish Between the Baubles is a gorgeous pine green with a strong linear holo effect. I love it so much! It runs smoothly on the nails and needs no special base coat. It’s very opaque, too, and that leads to it being a stainer. Yup! Green nails at the end so be sure to double up on base coat. I swear it’s worth it! 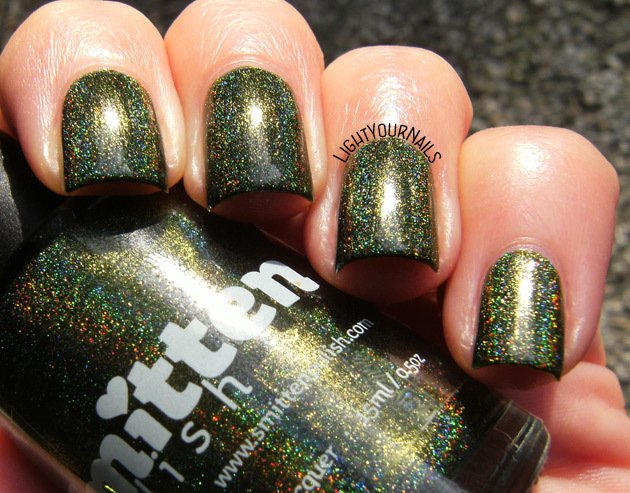 I think it might well be my favourite green holo, and you know I love green and holo so that means a lot! Smitten Polish Between the Baubles è un verde pino con un effetto olografico lineare molto marcato. Si stende facilmente sulle unghie e non ha bisogno di basi speciali. E’ molto coprente, e questo lo porta a macchiare le unghie quindi assicuratevi di mettere un doppio strato di base. Ne vale assolutamente la pena. Penso che sia il mio smalto verde olografico preferito, e come sapete io adoro gli smalti verdi e quelli olografici, quindi per me vuol dire tanto! It is a striking shade and I love it. Smitten makes so good polishes. I love this kind of green so this is a big thumbs up from me! This is my first Smitten but I already have my eyes on more shades! I don't like stainers but this one is so gorgeous!!! I love it, it's such a beautiful green with an amazing effect ! Wow! This is a gorgeous shade of green!! Looks great on you! Wow, this is beautiful! I really like that shade of green! My jaw dropped. THis is gorgeous! I usually wouldn't bat an eye at this shade, but oh my gosh this is gorgeous! I love how you manage to capture the holo perfectly. This shade of green seems quite popular lately - it feels similar to ILNP Ski Lodge. Love the strong holo! This is so deep & beautiful!